I should begin by saying Jan Lee and I shared a dramaturgy course last year given by Lou Cope. What drew me to the course was the similarity I felt between dramaturgy and the process of writing about dance; one helps build the internal cohesion of a work while the other attempts a deconstruction of the work to reveal that cohesion. Lou had suggested that any of the participants who wanted dramaturgical help on future projects should ask amongst themselves as a way of offering practical experience, which is how I came to work with Lee on her How To Play A Room. It is a privileged position from which to write as I can view the work, as it were, from somewhere in the middle. 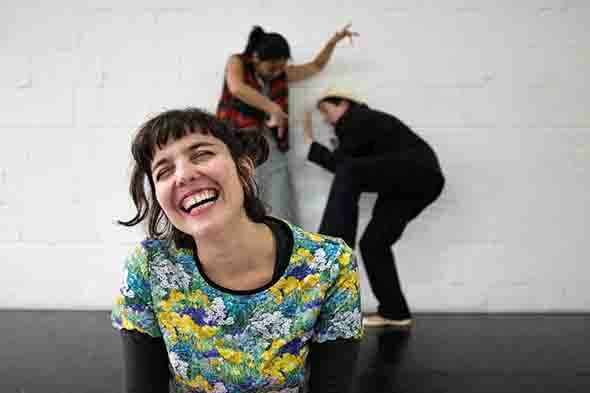 In How to Play a Room Lee explores her own experience of being an outsider crossing social boundaries, of how to play a room when you don’t feel you belong, so having three performers of different nationalities (Katsura Isobe, Danai Pappa and Thelma Sharma) is no coincidence. Lee approaches dance with a musical mind as she is both a musician and dancer; she makes musical gestures with the bodies of her dancers and uses their voices and her own processed recordings of conversation as muscular elements in the choreography. How to Play a Room about the messiness of hybridity and the discovery of what remains inviolable. Isobe may mistranslate the physical conversation of Pappa and Sharma, and may have difficulty finding a way into their circle, but her own identity is poignantly clear in her singing of a Japanese lullaby at the end. Pappa is anchored in a dramatic reality that moves with her and she can transform her environment — especially when expressed in voluble Greek — into an emotional maelstrom, while Sharma is a Chaplinesque figure who finds strength in making sense of the world’s conundrums; she plays down her own identity and knows instinctively how to play a room. Lee and her dancers have collaborated to allow all these elements to overlap like three beams of different-coloured light to see what develops where they meet. The process is as messy as hybridity itself but somehow Lee manages to keep all the action on stage, illumined by the costumes of Elisa Nader and the lighting of Lucy Hansom, so that How To Play A Room emerges as a celebration of cultural fluidity. There is something brutally physical in much of the dance I have seen from Spain but there is a beauty that inevitably arises from it. Denis Santacana Dance Company’s Encuentros has both a grounded physicality that borrows from flamenco and moments of sinuous energy that fly upwards. Encuentros is as much a duet about the juxtaposition of two contrasting personalities — Santacana and Victor Fernández — as it is about the overlap between the earthy and the ethereal. But if physicality is the motor, the imagery of Encuentros is mercurial, borrowing from chance meetings with changing outcomes; it is not linear but seems to move forwards and backwards. Chairs, a table and a wine glass suggest the nature of the meeting place but the table and chairs also serve as platforms for dancing, and the glass becomes a musical instrument. The relationship between the two men oscillates between manipulator and manipulated, between puppet master and puppet, and between acceptance and rejection, all depicted through episodes of careful shading and projected shadows. The imagery merges into the physicality, sometimes tortured and percussive, sometimes sinewy and light, until the story is exhausted. It’s all in the cinematic flow of the music, too: Encuentros by Victor Guadiana. Standing on a tall pedestal, Hanna Wroblewski with her trademark red hair and flowing robe, cuts a statuesque figure. In Darling, I Don’t Sell Dreams… she shrinks the theatre (with the help of Joseph Bisat Marshall’s design and Lucy Hansom’s lighting) into an artist’s studio in which she is both the model accepting our gaze and the artist of her own creation. Inspired by her ‘fascination with the public and private personas of silver screen sirens’, Wroblewski plays a very public figure to the music of her very private thoughts. In her stillness, the bareness of her legs, the downward angle of her head and the sound of her heavy breathing, she at first appears to be on a ledge contemplating her fate. As she leans further, tiny bright red hearts cascade from her dress, flashing in the light as they fall around the pedestal. Gravity wins, but the hearts are escaping dreams. She begins to hum as she continues to revolve, letting her hair down, dipping a leg languorously to either side or raising a pliant arm, to reveal both her defiance of fear and her full sculptural presence. It takes a lot of courage to maintain this slow revolution (interestingly it allows us to conjure up so many images) but it becomes a dream-like metaphor for another kind of courage Wroblewski is about to reveal. After lowering herself over the pedestal, head draped towards us, she breaks the silence with an admission: she has an age-old fear of singing in public except, she realises, when she is feeling comfortable with her surroundings. Evidently she does here, for she launches into the sentimental ballad, Dream A Little Dream Of Me, finding just enough breath and just the right notes, not selling dreams but wrapping them up as gifts.